GUISEPPE CAMPAR I and Tazio Nuvolari driving together on one of the new 2i-litre straight-eight Alfa-Romeos won the Italian Grand Prix which was run at Alonzo. on Sunday, 24th May. 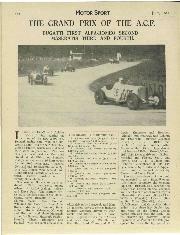 Second place was captured by another Alfa-Romeo _ of the same type driven by the veteran Minoia and Borzacchini, with Albert Divo and Guy Bouriat on one of the new Bugattis third. In the 1,500 c.c. class Ruggeri and Balestrero were first on one of the old 1927 Grand Prix straight-eight Talbots, just beating Pirola and Lurani on a 6-cylinder Alfa-Romeo. car wasto drive it at high speed for a long period of time. 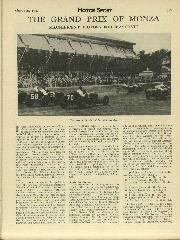 Like every other attempt to revive real motor racing, the idea was immediately decried by the technical press in every country of Europe ; but it was adopted by the Sporting Committee, and the race which took place at Monza certainly seems to have shown that the formula has much to recommend it. Varzi and Chiron (Bugatti I). Divo and Bouriat (Bugatti II). 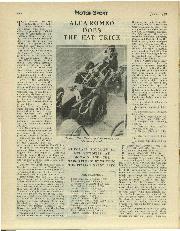 was to be driven by Lettieri was also an absentee as was an Itala entered by Facehetti and three Bugattis whose drivers had never been announced. 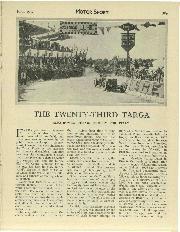 Of the cars which were left the most likely to prove the winner was obviously either one of the two Bugattis or one of the three Alfa-Romeos entered by their manufacturers. The Bugattis were of course of the new 2,300 c.c. type with the double overhead camshaft straight-eight engine and had as their drivers Achille Varzi, Louis Chiron, Albert Divo and Guy Bouriat who form the official Bugatti team. Two of the Alfa-Romeos which were to be driven by Campari, Minozzi, Affinoia and Zehender were of the new 24-litre straight-eight type, while the third, to be driven. 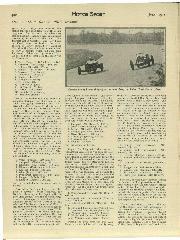 by Nuvolari and Borzacchini was the new 12-cylinder racer to which reference is made elsewhere. Of the remaining entries the two other Bugattis were driven by amateurs, and the 1,500 c.c. class consisted of Senechal's Deluge and the two Talbots, all three of which are 1927 Grand Prix racers, together with the two remaining AlfaRomeos which were 6-cylinder machines. 1. Varzi (Bugatti), 162 kilometres 700. 2. Campari (Alfa-Romeo), 160 km. 3. Lehoux (Bugatti), 159 km. 4. Minoia (Alfa-Romeo), 154 km. 1. Varzi (Bugatti), 329 km. 600. 2. Campari (Alfa-Romeo), 322 km. 3. Nuvolari (Alfa-Romeo), 313 km. 4. Minoia (Alfa-Romeo), 312 km. 5. Lehoux (Bugatti), 311 km. 6. Divo (Bugatti), 302 km. 7. Ivanowski (Merced's), 295 km. 8. Ruggeri (Talbot), 293 km. 9. Klinger (Maserati), 291 km. 1. Campari (Alfa-Romeo), 466 km. 2. Minoia (Alfa-Romeo), 462 km. 3. Lehoux (Bugatti), 459 km. 4. Klinger (Maserati), 446 km. 5. Divo (Bugatti), 446 km. 6. Chiron (Bugatti I), 446 km. I. Campari and 638 km. 2. Minoia and xneo), 610 km. 4. Divo and Bouriat (Bugatti), 560 kin. 5. Ivanowski and Stoffel (MercaVs). 6. Wimille and Gaupillat (Bugatti). 7. Pirola and Luram (Alfa-Romeo). 1. Campari and Nuvolari (AlfaRomeo), 784 km. 4. Klinger and Gliersi (Maserati), 707 km. 5. Ivanowski and Stoffel (Mercedes), 697 km. 6. Ruggeri and Balestrero (Talbot). 7. Wimille and Gaupillat (Bugatti). 8. di Vecchio and Ferrari (Talbot). 9. Pirola •and Lurani (Alfa-Romeo). 1. Campari and Nuvolari (Alfa-Romeo), 931 km. 2. Minoia and Borzacchini (Alfa-Romeo), 923 km. 3. Divo and Bouriat (Bugatti), 900 km. 4. Klinger and Ghersi (Maserati), 865 km. 5. Winaille and Gaupillat (Bugatti) 831 km. 6. Ifanowski and Stoffel (Mercedes). 7. di Vecchio and Ferrari (Talbot). 8. Pirola and Lurani (Alfa-Romeo). 9. Ruggeri and Balestrero (Talbot). Campari completed 1,000 kilometres in 6 hours 26 minutes 30 seconds, or at an average speed of just over 97 m.p.h. Nearly half an hour later, however, poor Senechal, after seven hours running, had only covered 489 kilometres. 1. Campari and Nuvolari (Alfa-Romeo), 1,547 km. 500. 2. Minoia and Borzacchini (Alfa-Romeo), 1,534 km. 800. 3. Divo and .Bouriat (Bugatti), 1,525 km. 300. 4. 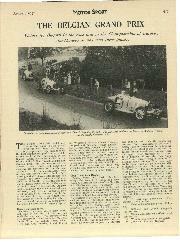 Wimille and Gaupillat (Bugatti), 1,385 km. 950. 5. Ivanowski and Stoflel (IVIercedi:s), 1,341 km. 100. 6. Ruggeri and Balestrero (Talbot), 1,290 km. 200. 7. Pirola and Lurani (Alfa-Romeo), 1,290 km. 080. The winners' average speed of 154.755 k.p.h. is equal to approximately 96.16 m.p.h. The winning Alfa-Romeo is one of the new racing editions of the 2,300 c.c. sports model which appeared for the first time in the 1,000 Miles Race in April. The 8-cylinder engine now has a bore and stroke of 76 x 88 mm., giving a capacity of 2,476 c.c., the bore having been increased by 2 mm. 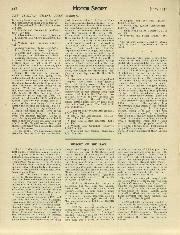 compared with the original sports edition. The cylinders are east in two blocks, with the ten bearing camshaft bolted together in the centre, where are two helically cut gear wheels, one driving the supercharger, oil pumps and water pump, and the other operating the two overhead camshafts through a couple of intermediary pinions. There are two valves per cylinder and the valve gear is very similar to that on the 6-cylinder 1,750 c.c. model. The sparking plugs are situated in the centre of the cylinder head and are fed by a coil. The supercharger, which is of Roots type runs rather above engine speed, the compression ratio is 6.2 to 1, and dry-sump lubrication is used. The engine is built up as a unit with a multi-disc clutch and 4-speed gearbox, while the propellor shaft is enclosed in a torque tube. Suspension is by 4-elliptic springs all round, those at the front being shackled at their forward end. 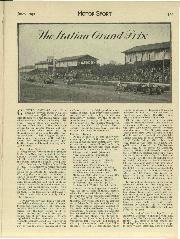 THE GRAND PRIX OF THE A.C.F.